Yes, it's me, Rupert Rat, back with the Rat Collective. We warned you, didn't we? Don't let Mr Bumpy become PM? Do you remember us telling you that? 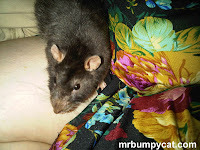 Well, since, looking at the opinion poll on the right-hand side of mrbumpycat.com it looks like a Feline Pawty win is inevitable, we thought it was important to at least balance Bumps with cats that are a little more benign. 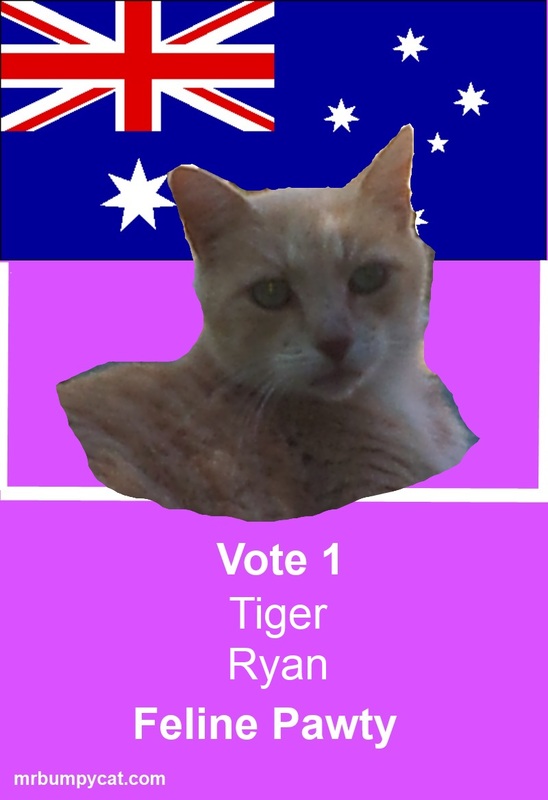 To that end, we've put our new feline housemate, Tiger up for the seat of Ryan, in Brisbane, Qld. Tiger lives with us and Miss 21. He didn't need to be told that anyone who lives in a cage isn't food, he wouldn't think of eating us. He's a very, very nice cat and would never be mean to anyone. Tiger's exactly the opposite of megalomanicat Mr Bumpy. If you're going to elect Mr Bumpy as Prime Minispurr, make sure you elect gentle cats like Tiger as well. PS Montgomery and Chester send their best.